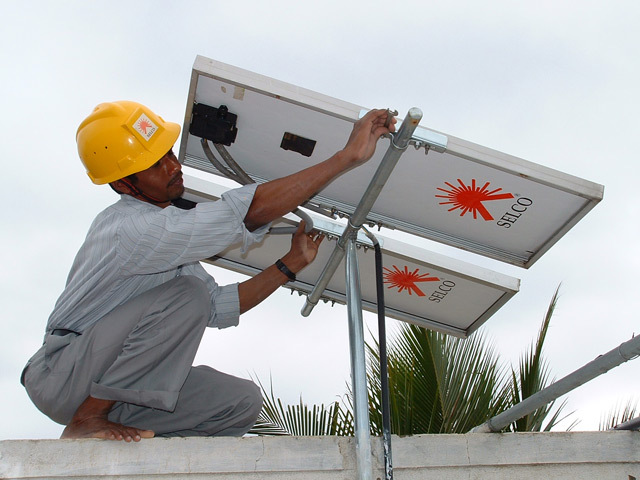 SELCO is an important player in rural electrification in Karṇāṭaka and Gujarāt. Harīsh Handé, a colleague of mine from IIT Kharagpur, made a life-choice by starting SELCO to bust three myths – the poor cannot afford technology, the poor cannot maintain technology, and you cannot sustain while serving the poor. SELCO serves people with less than a dollar a day income, and is socially and financially sustainable. Its customer base in Karnataka is well over 120,000 which includes poor daily-wage workers, and the Dalai Lama is also on their happy customer list. 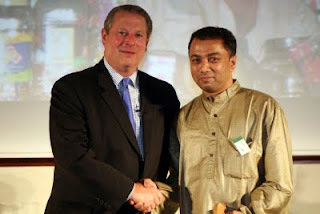 Harīsh and SELCO have received the Ashden Award twice among other awards, from famous personalities like Al Gore, Bill Clinton and Prince Charles. Harish Hande receiving the Ashden award in 2007. And as per news yesterday, he has been awarded the Magsaysay award for this 2011 as well! Well done Dr. Hande, it is an honor to know you. They go home-to-hut, installing the entire kit which includes a solar panel, a rechargeable battery and lamps. The clients get loans from banks, for they cannot afford even the already low prices. One client wanted light in two rooms, but did not have money for two separate kits. His daughter could study in the kids’ room while his wife could do sewing in the ‘master’ bedroom. The two small rooms of the house shared a wall. So, the technician at hand cut out a small hole in the common wall and installed the lamp right in between, lighting both for the price of one. That is the threshold lamp maxim. A lamp placed on the threshold, lights up the inside as well as outside. SELCO technician setting up a solar panel. Today, people want everything individually. Transport, movies, exercise machines are just few examples of what was earlier shared communally, resulting in less production and overall consumption. Another important aspect is the modern practice of a TV in each room. It signifies the capacity to splurge, but disconnects the family members. You do not know what your kids are watching. Share and use wisely! Use resources wisely and creatively. 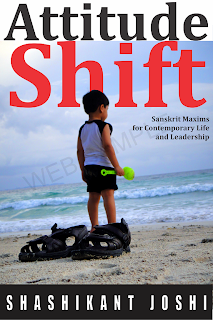 The above story and Sanskrit maxim is also in the book of Sanskrit maxims for leadership and life - Attitude Shift - available in print and ebook form. 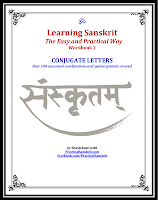 Check Kindle, Flipkart or publisher page. déhalī = threshold, the door frame.